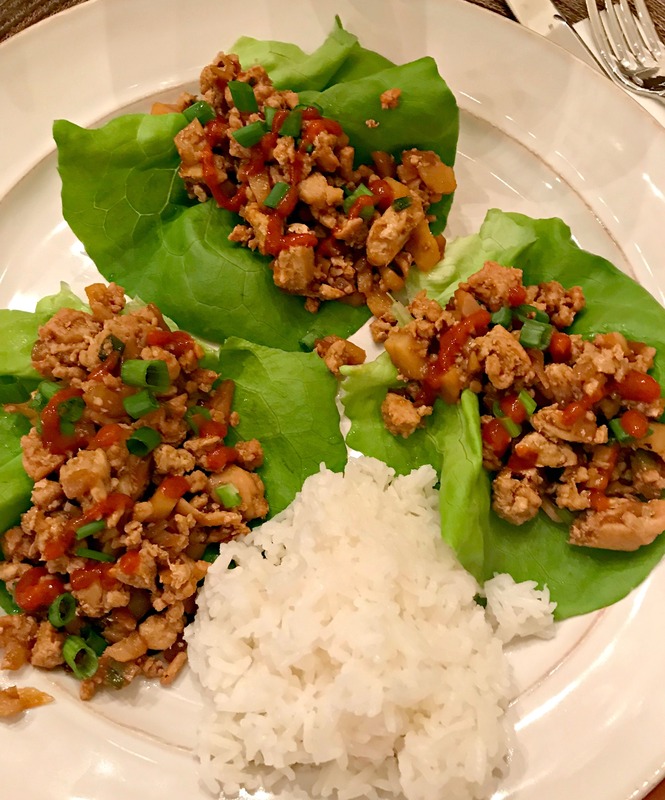 These Chicken Lettuce Wraps are healthy, simple to make, and taste just like the classic signature recipe from PF Chang’s. Low carb and packed with flavor, these make a great dinner or appetizer option! A few weeks ago, my moms neighbor had her over for dinner. 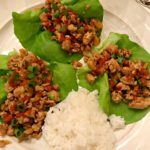 Her neighbor had made Chicken Fried Rice and these tasty Chicken Lettuce Wraps. My mom text me the pictures of the rice telling me how much she enjoyed it, but unfortunately never took pictures of the wraps. Since she enjoyed them so much though, she decided to make them for my dad and her and send me the pictures of those! 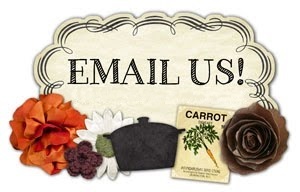 The rice was a huge hit with you all, so I know these will be too! Have y’all ever tried these wraps at PF Changs? Well, my hubby and I have and love them! Years ago, we had date night and chose to go to PF Changs for the first time. Our waiter suggested these wraps to us as an appetizer since we asked for his opinion on what to order. One bite in, we knew we made a good choice. The chicken was packed with flavor and the lettuce kept these “light” tasting and added a slight crunch that was delicious! My mom ended up having leftovers from the dinner she made, so the next day, she packed a container and dropped it off for my hubby and I to try. We had it for our dinner and thoroughly enjoyed it! Tasted just like the ones we had at the restaurant years ago and will definitely be added to our meal rotation! 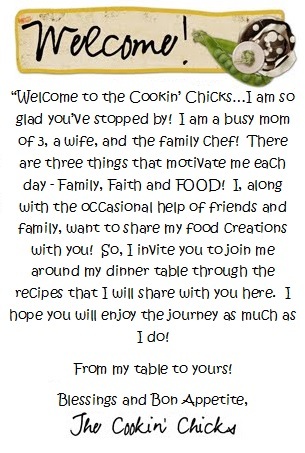 Thanks Christi for the fabulous recipes and thank you mom for sending the pictures (and leftovers) my way to share with everyone! 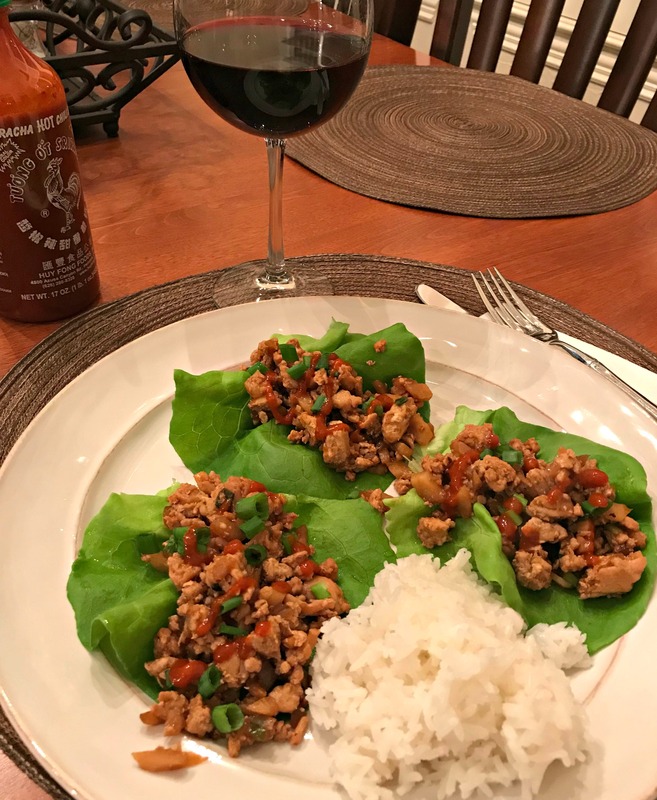 These Chicken Lettuce Wraps are healthy, simple to make, and taste just like the classic signature recipe from PF Chang's. Low carb and packed with flavor, these make a great dinner or appetizer option! Add ground chicken and cook until browned, about 5 minutes. Be sure to crumble the meat as it cooks and drain fat afterwards. Add in the garlic, diced onion, hoisin sauce, soy sauce, rice wine vinegar, ginger, and Sriracha (if using). Cook for about 2-3 minutes. Stir in the chestnuts and green onions until tender and season with desired amount of salt/pepper. Remove from heat and serve. *Spoon desired amount into the center of a lettuce leaf.